Last Sunday, a 39-year-old man from Devon flung himself down a 600-metre rock face and landed in the record books. On the way, James Stentiford leapt over jagged rocks, edged down narrow gulleys, soared over a cliff and swept in graceful curves across open snowfields. It was a fast and fluid run that won him a podium place at the Nissan Xtreme Verbier, the most prestigious freeride event in the calendar – a first for a British snowboarder. It’s a dramatic achievement at an event that is thrilling and terrifying to watch in equal measure. The contest is held on the 3,223-metre Bec des Rosses, a dauntingly steep mountain festooned with rock bands and cliffs, with gradients ranging from 45 to 60 degrees. Several thousand spectators watch from the mountain opposite, following the action through binoculars or on giant screens that display images beamed from the helicopters that circle overhead like vultures. Anyone thinking that an inability to feel fear was a requirement for taking part would be wrong. Even the hour-long hike up is scary, says Stentiford, for it leads over giddying cliffs. Part of the anxiety, says Stentiford, is worrying about what might go wrong. “You definitely think about getting hurt,” he says. 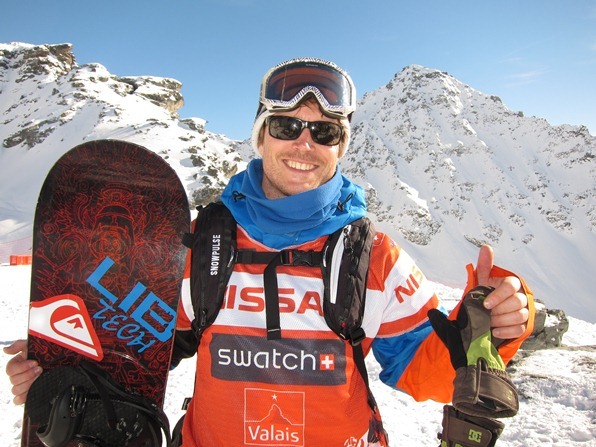 He soon figured out how to make money out of sponsorship, and has been a professional snowboarder ever since, based for the winters in Chamonix. The first few summers he did odd jobs to finance his passion – anything from car valeting to working for international directory enquiries. In recent years, he has been running a snow, skateboard and surf team for DC, a manufacturer of footwear and sports equipment. He spends his summers in North Devon, where he lives with his girlfriend, and indulges his other passion – surfing. Podium finishes are, however, something of a novelty. “To be honest, competing isn’t really my thing, it’s not what snowboarding is about for me,” he says, echoing the sentiment of many freeriders. But this year, he decided to enter the Freeride World Tour – partly “as an excuse to spend more time in the mountains” – and found himself gradually working his way up the rankings. In Chamonix, at the start of the Tour, he came ninth, before scoring fifth in St. Moritz, fourth in Sochi, Russia, and third in Fieberbrunn, Austria. “When people ask me the best resort to ride, I always say: it’s the place you know best. You know the danger points, you know what it looks like in summer, you know about all the cliffs, what’s underneath the surface of the snow. For me, that would be the mountains near Lake Constance, where I grew up, and around Innsbruck, where I live now. 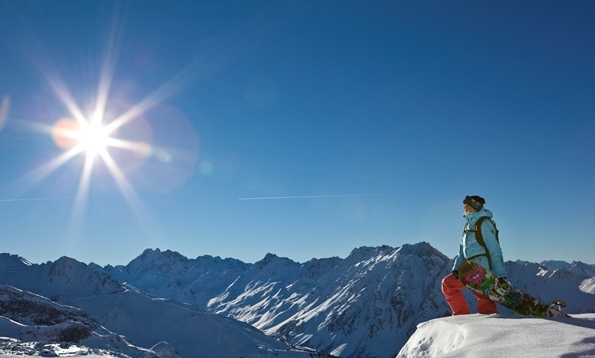 I totally recommend the Arlberg – places like St. Anton and Lech. The whole area is amazing to ride. It has everything – tree runs, steep faces, gnarly faces if you really want to go crazy. I’ve been riding there since I was a little kid – it’s just an hour away from Lake Constance and an hour from Innsbruck. I know the danger zones, I know which cliffs are kind of gnarly, and where I should take care. If it’s really safe and stable, there’s always a lot of lines to do, but if it’s just dumping with snow, you can always hide in the trees – where there’s a good feel, and it’s not so dangerous because it’s a lot less steep. If friends come to visit, and there’s not a lot of powder, I love going to one of the parks. We often go to Mayrhofen – I really recommend the Mayrhofen Vans Penken Park. I’ll still do some kickers and rails – it’s like going back to my past. Before freeride, I started with competitions in the half-pipe and slopestyle. In fact, I think it’s important to do all kinds of riding. You shouldn’t be just a freerider, or a freestyler, or do just boarder cross – being an all-round snowboarder is what makes a snowboarder good. So every time friends come to visit and we go riding in a park, I’m totally stoked. One place that is special because it is so close to the city – Innsbruck – is Axamer Lixum. It has really nice, steep slopes, but it’s also a great family resort. If there’s powder you can also go in the trees. It’s not super-gnarly, but the mountains are amazing – you feel like you could be in Chamonix, the views are like – wow! Outside Europe, I have been riding quite a lot in Squaw Valley lately – but I would recommend the whole Lake Tahoe area.It’s not known for super-speed gnarly lines, but it’s great fun to ride there. It has super-nice mountains with an amazing view down to the lake, and tree runs all over the place. If they have a storm, it goes on for three days, and you can have a metre of fresh powder – and then you can be sure that you’re going to have a week of sun, because it’s California. It never gets that cold, either – here in the Alps you have sometimes minus 20 degrees; over there, minus 5 to minus 10 is the coldest it gets. Sometimes it gets really warm, so you have to get up really early. Number five would probably be my home town, where I learned skiing. A lot of people haven’t heard of it. It’s called the Bregenzerwald, in the Vorarlberg in Austria. It’s where Gigi Rüff comes from – he’s an amazing snowboarder. It consists of lots of different villages; but Damüls would be the one for me – it feels like home. It has everything you could ask for – you can go backcountry and find really nice slopes. And it’s great for learning, too. If you want to go off-piste, though, you should always check out the avalanche risk, and make sure you know how the snow layers built up over the season. It’s really important to get training in off-piste safety. Axamer Lizum (www.axamer-lizum.at) was the venue for many of the alpine events of the Winter Olympic Games that were held in Innsbruck in 1964 and 1976. The ski area is 50 minutes by bus from the city, one of the most appealing in the Alps; the journey is free with a local lift pass. Ski packages to Axamer Lizum are available from Crystal (www.crystalski.co.uk), and city/ski breaks based in Innsbruck from Inghams (www.inghams.co.uk). Lake Tahoe is one of the deepest and clearest freshwater lakes in the world, surrounded by the mountains of the Sierra Nevada – which tend to have gentler contours and thicker tree cover than, say, the Colorado Rockies. The best views of the lake, arguably, are from the ski slopes of Heavenly (www.skiheavenly.com). There are seven ski areas around the lake, including the venue for the 1960 Winter Olympic Games, Squaw Valley (www.squaw.com). 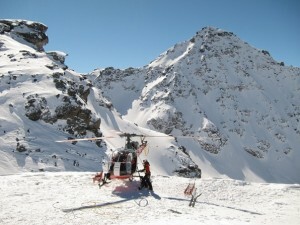 Trips to the two resorts are available from Ski Safari (www.skisafari.com) and Ski Independence (www.ski-i.com). The Bregenzerwald (www.bregenzerwald.at) consists of 22 villages, little known among British skiers, in the far west of Austria, close to the borders with Switzerland, Liechtenstein and Germany. 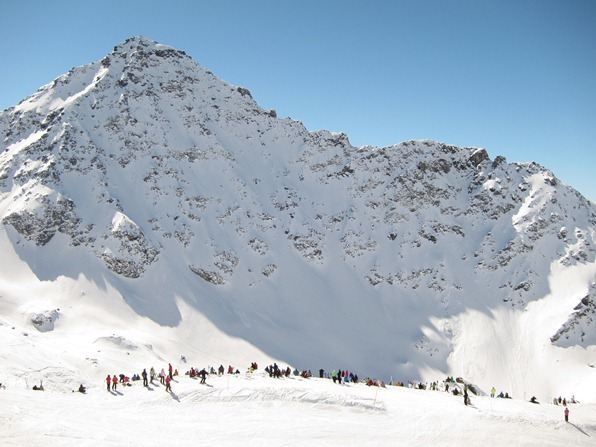 Damüls has access to 109km of piste rising to an altitude of 2,100 metres, and is regarded as reasonably snow-sure. 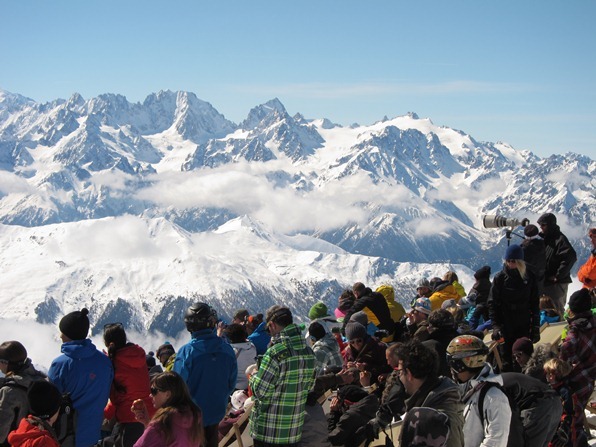 You can buy day passes for the different ski areas; passes of two and a half days or longer cover all 17, plus a couple of neighbouring regions. For advice on arranging an independent touring holiday, contact the Austrian Tourist Office (www.austria.info/uk). The well-known resorts of the Arlberg (www.stantonamarlberg.com; www.lech-zuers.at and Mayrhofen (www.mayrhofen.at) appear in the brochures of most ski companies. In the flesh, Aline Bock does not appear out of her mind. This surprises me, because this 28 year-old German has made a name for herself by snowboarding vertiginous mountains and free-falling down cliff faces, all with effortless grace. It is because of her stylish riding that Aline is the current Women’s Snowboard Freeride World Champion. The title is decided over a series of events known as the Freeride World Tour, in which skiers and snowboarders compete side-by-side. It was at the culminating event of last season – the Nissan Xtreme in Verbier, in which Aline came second – that she was crowned overall winner for 2010. She has begun this season well, winning the opening event of the women’s tour earlier this month, at La Clusaz in France. The men’s and women’s tours go on to take in resorts throughout the Alps as well as the Rocky Mountains, California’s Sierra Nevada, and even the Russian Caucasus – at Sochi, the venue for the 2014 Winter Olympic Games. 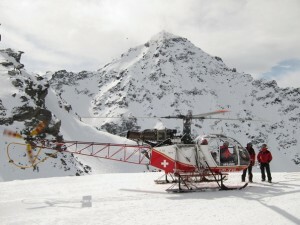 Only at the finals – the Nissan Xtreme in Verbier, on March 19 – will we find out who will be World Champion for 2011. The latter event is held on the 3,222-metre Bec des Rosses, a scarily steep mountain festooned with cliffs and rock bands: 500 metres from top to bottom, it was considered unskiable until a few years ago. There are no lifts or helicopter transfers: competitors have to hike to the jagged summit. You feel giddy just looking at it. The Nissan Xtreme attracts about 5,000 spectators – skiers and snowboarders, mostly – who watch from the Col des Gentianes, served by the Jumbo cable car. From here, they follow the riders through binoculars, and watch footage beamed onto giant screens, much of it filmed from helicopters. At points – where the competitors launch over the top of a cliff, and free-fall down a rock face to the powder below – the entire crowd holds its breath. A panel of judges watches the competitors through binoculars, judging each for choice of line, fluidity of run, and level of control. One of the skills you need on the Bec des Rosses, says Aline, is the ability to plan and memorise your route in advance. For the face is so steep that you cannot see ahead of you for more than a few metres; as you leap over a cliff, you cannot see where you are going to land. 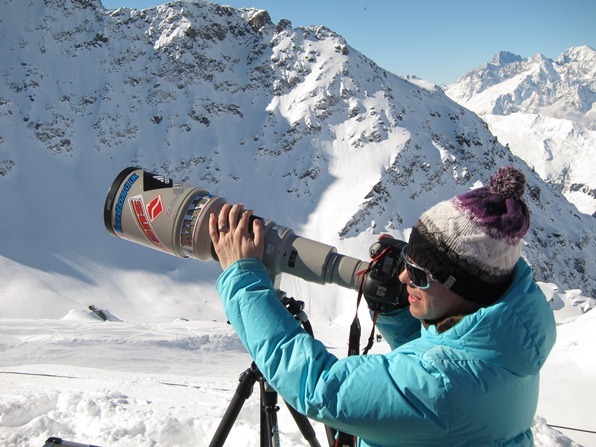 Which is why, in the days leading up to the contest, competitors scrutinise every detail of the face – powder fields, couloirs, cliffs, rocks – through binoculars, and figure out the route they will take. You normally know what you can expect to find in a ski school brochure. Group courses, private lessons, children’s club, perhaps a special cool school for teenagers. But a bodyguard service..? The Swiss Ski School of Verbier has just published its new brochure, and believes it may have come up with a first – by offering skiers the services of a Swiss-qualified instructor who is also a trained bodyguard. You may wonder why you might need one. Have manners really become that bad on the slopes? Are the rosbifs really so boorish and unpopular that they risk being lynched on the piste? Or have the lifts become so crowded that you need a bodyguard to defend your place in the queue? Not according to the man in question, Michael Mason from Brighton. He expects his services to be of interest to visiting celebrities, and to super-wealthy skiers worried about the risk of kidnapping. So what, you wonder, would a ski instructor/bodyguard actually do when things get ugly? Unclip his skis for a round of fisticuffs? Bundle his celebrity client onto a waiting skidoo to whisk them away from irritating fans? Smuggle them down the slope incognito in a blood wagon? Mason’s protection extends to breaks, as well – for example, avoiding exposure in visible locations by making reservations for lunch, using a false name that has been agreed with the restaurant. When he is not in Verbier, Mason is based in Brighton. 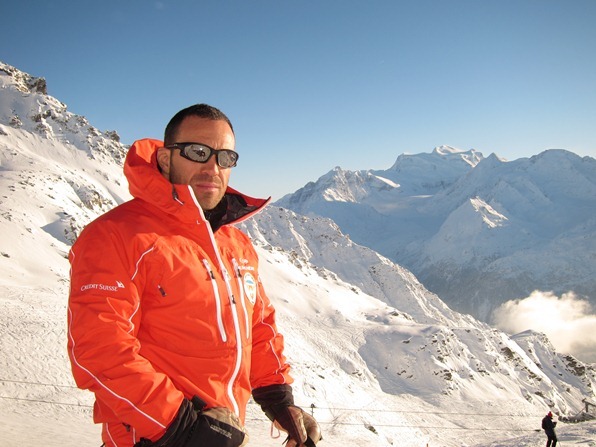 Outside the ski season, he teaches martial arts and self-defence around Britain, works as a freelance bodyguard, and runs courses in close protection – mostly for former soldiers who want to work as bodyguards. He discovered skiing on a school trip, aged 16, and fell in love with the sport immediately. 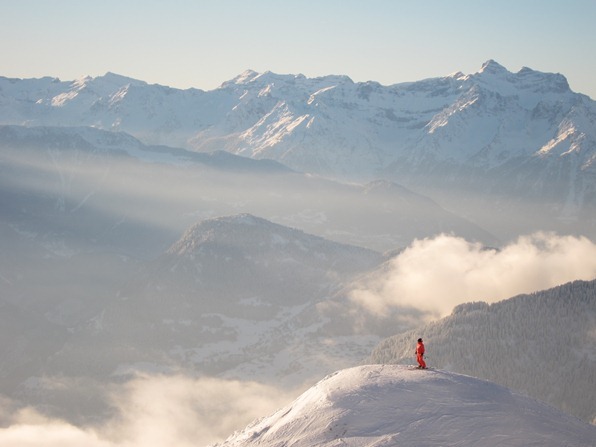 For many years he skied for pleasure, before training as an instructor in Verbier – where he has worked for the local Swiss Ski School every winter since. His passion for martial arts, meanwhile, began at the age of ten: “It was at the height of the Bruce Lee era. There was a programme on TV called Kung Fu with David Carradine, and the first time I saw that I was hooked.” Mason took up karate while he was still at school, and went on to train in the Japanese martial art of aikido, before qualifying as in instructor in Krav Maga, a combat system developed in Israel. Soon after, he discovered what was to become his calling – the Japanese martial art of Ninjutsu. For the past 20-odd years, he has been travelling to Japan for a month every year to train with a grand master. Ninjas are known in popular culture, both in Japan and in the West, as masters in sabotage, espionage and assassination. Over the centuries, they have gained a reputation for possessing supernatural skills – such as being able to control the elements, and become invisible. For Mason, it is not just the oldest of Japanese martial arts, but also a highly spiritual discipline. “It’s not about how well you can kick, or punch, or throw someone, it’s about how well you can recover from being punched, kicked or thrown. It’s about developing the spirit of survival. Much of the discipline, according to Mason, is about controlling your ego. “You don’t get into a fight just because you think you’re tough. Sometimes it means avoiding trouble. It’s about picking your fight at the right time, when the odds are in your favour.” Which fits in with the image of Ninja as the stealthy, quick-witted fighter of folklore.